Heat oven to 350°F. Grease bottom and side of round pan, 9x1 1/2 inches, with shortening; lightly flour. Beat all ingredients except orange segments and whipped topping in medium bowl with electric mixer on low speed 30 seconds, scraping bowl constantly. Beat on high speed 3 minutes, scraping bowl occasionally. Pour into pan. 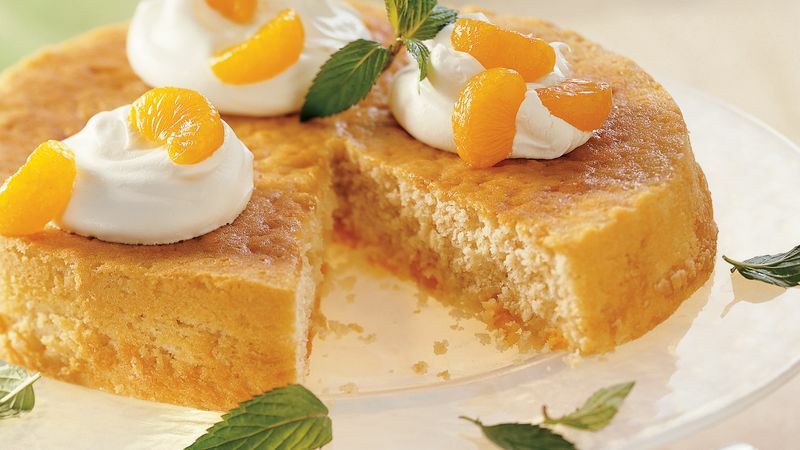 Place orange segments evenly on batter, reserving 6 or 8 orange segments for decorating. Bake 35 to 40 minutes or until toothpick inserted in center comes out clean. Cool 10 minutes; remove from pan to wire rack. Cool completely, about 1 hour. Top with whipped topping. Decorate with orange segments. For more orange flavor, substitute 1/2 teaspoon orange extract for the vanilla. Create a different look the next time you bake this cake. Place cake wedges on dessert plates, spoon whipped topping on top and sprinkle with coconut or toasted almonds.